There’s a hilltop village in the Tarn called Cordes-sur-Ciel. 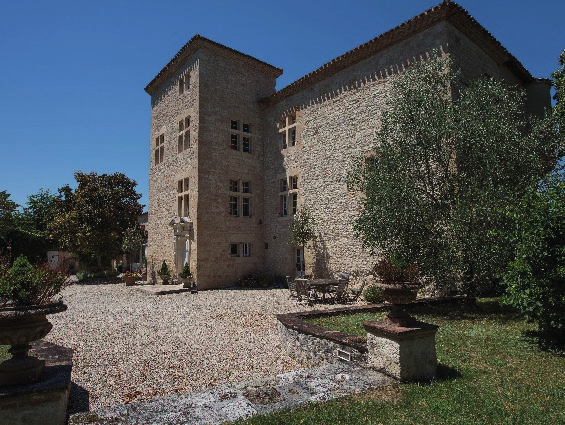 It’s said to be the first bastide ever constructed, back in the 13th century. But it wasn’t originally planned for this location at all – under the charter of the Count of Toulouse, a different hilltop was chosen. Legend has it that, every morning, when the builders turned up, they discovered all their hard work had been destroyed during the night. This continued for a whole month. Eventually one of the builders, enraged, threw his trowel into the air. A few days later, the trowel was found on a nearby hilltop. Taking this as a divine sign, the Count relocated Cordes-sur-Ciel to its present site. The beautiful village now forms the northern tip of what’s known as the Triangle d’Or du Tarn, or the Golden Triangle of the Tarn. Any property search in this département really ought to start here. Deep in the southwest of France, between the cities of Toulouse and Montpellier, the Tarn (not to be confused with neighbouring département Tarn-et-Garonne) occupies an enviable position with the Mediterranean to the east, the Atlantic to the west and the Pyrénées to the south. It’s a distinctly rural département, with an average of just 66 humans per square kilometre living across its limestone and sandstone hills, and its green valleys. The good news for British expats is that, despite the rural location, travel to and from here is surprisingly easy. There are four international airports within easy driving distance – Toulouse Blagnac, Béziers, Carcassonne and Rodez – plus an autoroute that links the Tarn’s prefecture town Albi to both Toulouse and Rodez. Nevertheless, it’s one of those places where you can quickly lose yourself. While the north of the département is mainly rolling countryside, dominated by the huge cut of the River Tarn valley, head southeast and you’ll see the hills rise, the valleys deepen and the forests thicken. Here you’ll find the mountain ranges of La Sidobre and Monts de Lacaune, with the Roc de Montalet rising to 1,259m. On the département’s southern border is a range called Montagne Noire. Dominant, too, is the in parts very wild Parc Naturel Régional du Haut-Languedoc – a 2,600 square-kilometre nature park that falls within the Tarn, Aveyron and Hérault départements. In the Middle Ages, this part of France was ravaged as a result of the wars against the Cathars, as evidenced by the many fortified towns and bastide villages you can still see punctuating the landscape today. The largest town, Albi (with around 50,000 inhabitants) has many reminders of its medieval past, most notably its mighty gothic cathédrale Sainte-Cécile. Its other claim to fame is that it was where post-Impressionist painter Henri de Toulouse-Lautrec was born. More than a thousand of his original works are celebrated at the Musée Toulouse-Lautrec. Many of Albi’s buildings are constructed in the regional orange brick, formed from clay found alongside the River Tarn. There’s no shortage of half-timbered buildings either. The other major town of the Tarn is Castres (41,500 inhabitants), which – despite all the light industry based there – has its charms, especially alongside the Agout river. 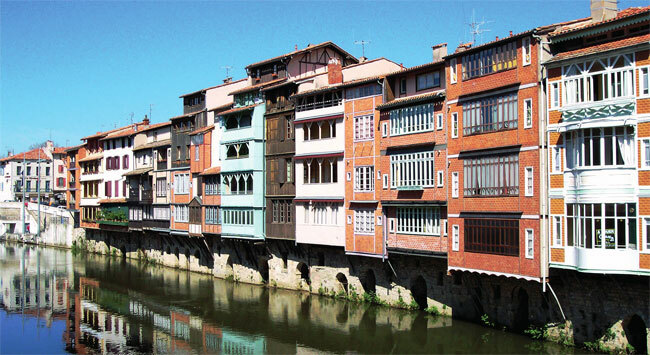 Castres is famous for being the birthplace of French socialism’s founding father Jean Jaurès. When it comes to cuisine, the Tarn finds itself within the orbit of Toulouse, even if the famous city falls inside a neighbouring département. So indulge yourself with rich regional dishes such as sausages (especially the white melsat variety), duck confit, veal, pigeon, cassoulet (the famous mix of beans, sausages and sometimes duck), cassoulet de morue (cod cassoulet), and even civet de sanglier (wild boar stew). The Tarnais use some very distinctive flavourings and accompaniments in their dishes. The pink Lautrec garlic, for example; the local black truffles; and the creamy, yellow cep mushrooms. There’s also saff ron, courtesy of a collective known as the Safran du Tarn et du Lauragais. One dish that includes the latter is le gras-double à l’albigeoise – beef or veal with onions, carrots, leeks and gousse d’ail (garlic cloves) plus many spices. Desserts are often dominated by the strawberries, cherries and apples that grow in central Tarn. Also try the regional pumpkin pancakes, and don’t miss Albi’s famous biscuits: fruit and vanilla navettes, lemon gimblettes and aniseed Jeannots. Roquefort may hail from the neighbouring Aveyron, but you’ll fi nd it served in just about every restaurant across the entirety of the Tarn. Other local cheeses include Blanche d’Oc, Bleu de Causses and Rocamadour. 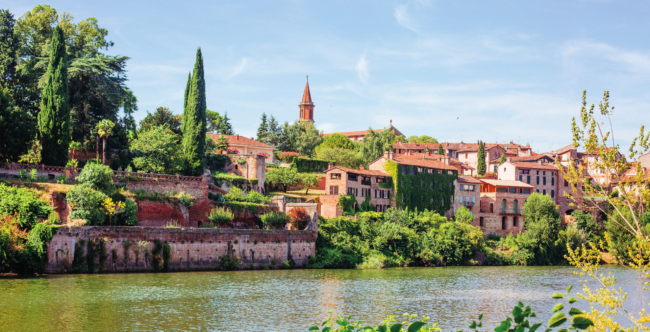 For wine, you should head to Gaillac where there are a score or more of AOC vineyards producing dry, fruity whites and rich, full-bodied reds. 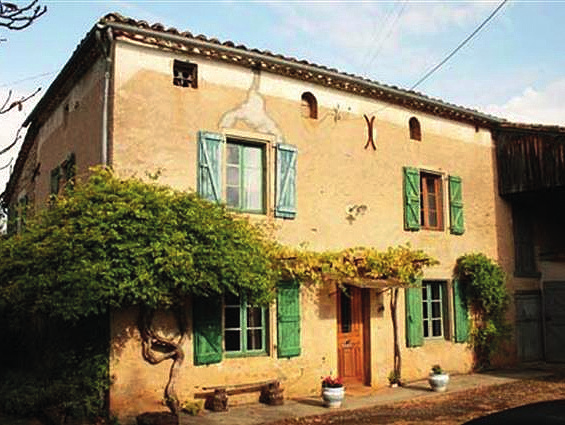 You’ll hear the phrase ‘Le Triangle d’Or du Tarn’ oftrepeated during any property search in this part of the world. The Golden Triangle in question is a relatively small area of just 200 square kms or so, in the northwest of the département, between Albi, Gaillac and Cordessur-Ciel. Three roads (the A68, the D922 and the D600) link the three towns together, surrounding a gorgeously rustic interior of rolling countryside, vineyards, medieval villages plus a beautiful section of the River Tarn that, over its entire length, twists west from the Cévennes mountains to Moissac. Of its medieval villages, Cordes-sur-Ciel is the most famous (it has the angry builder’s trowel to thank for that), but others that shouldn’t be missed include Donnazac, Noailles, Cestayrols, Senouillac and Labastide-de-Lévis. Given the Golden Triangle’s reputation, the older stone properties obviously command a premium. But head outside its boundaries and you may well pick up a bit more brickwork for your Euros. Castelnau-de-Montmiral, to the west of the triangle, is lovely; as is Lautrec, 25kms south of Albi; and Lisle-sur-Tarn and Rabstens, further down the Tarn river. Puycelsi, on the département’s northern border, has 800 metres of ramparts and glorious views over the Vère valley. Or there’s Penne, with its lovely château and proximity to the Gorges de l’Aveyron. WHAT ARE THE MAIN PROPERTY TYPES IN TARN? Opt for a small château outside the Golden Triangle and you’ll be astounded at the low prices. 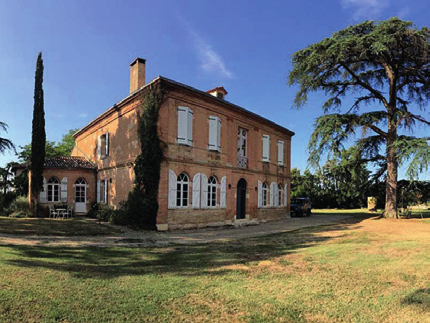 Some will even come with an accompanying swimming pool and a pigeonnier, which could be converted and rented out as a holiday gîte. 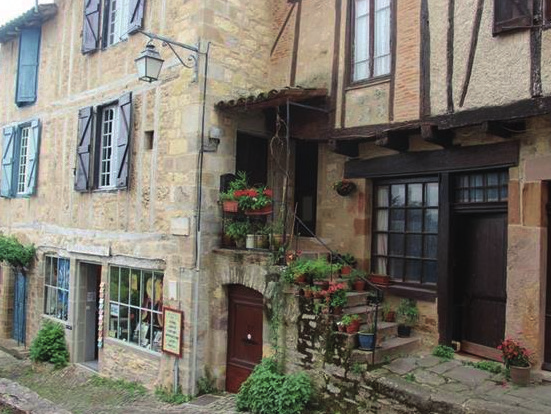 French estate agents have this theory that we Brits go crazy for their medieval old houses. And indeed some of us do. They make for beautiful, if rather tricky, restoration projects. As in many of the regions of France with cold winters, the farmhouses here typically used to house the animals on the ground floor, and the farmer and his family on the first floor. This way they could benefit from the rising bestial body heat. Nowadays, most have been converted for exclusive human use. There are myriad villages all over the southwest that feature achingly pretty stone houses with bags of personality. The Tarn is no exception. 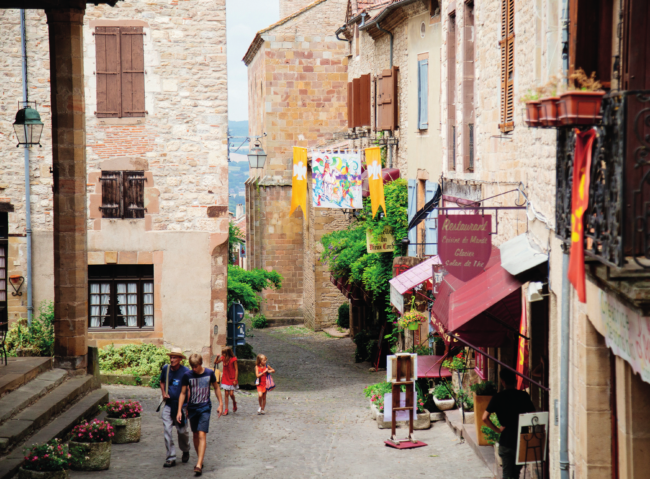 For the prettiest, you need to look in the bastide towns. Here it’s important to have well-pointed original stonework, replaced windows (modern so they keep out the cold winters but not in plastic – please!). Many come with a small amount of garden space. Across the Tarn you’ll find these characterful mansion type buildings constructed in white limestone; brown, grey or red sandstone; and brick. They don’t come cheap but are the sort of properties buyers fall in love with. 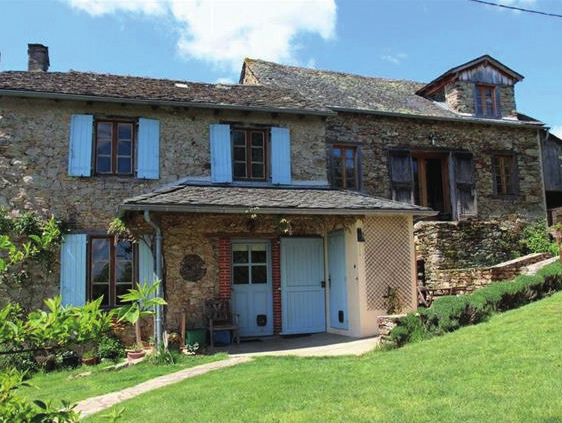 Most include oodles of land and outbuildings, ripe for conversion to gîtes – perfect for a holiday-let project, or just as somewhere you can make your mark and be the lord of your own manor.